Baptist explanation: There must be sin in your life. Everyone else opened it fine. Presbyterian explanation: It's not God's will for you to open this link. Word of Faith explanation: You lack the faith to open this link. Your negative words have prevented you from realizing this link's fulfillment. Charismatic explanation: Thou art loosed! Be commanded to OPEN! Unitarian explanation: All links are equal, so if this link doesn't work for you, feel free to experiment with other links that might bring you joy and fulfillment. Episcopalian explanation: Are you saying you have something against homosexuals? Christian Science explanation: There really is no link. Atheist explanation: The only reason you think this link exists is because you needed to invent it. Church counselor's explanation: And what did you feel when the link would not open? If you take a short train journey north from Amsterdam you really should choose to sit on your left. When you have passed the small town of Almere you will come across something that has not been seen in Europe for thousands of years. Beasties, big beasties. Herds and herds of them. Welcome to the Oostvaardersplassen. It looks to the observer as if they have suddenly been transported back in time. Herds of deer, wild cattle and horses roam around – it is like a vast prehistoric landscape. Strangely enough this place did not exist before 1968. It is a polder, a low lying tract of land that is enclosed by barriers called dikes. 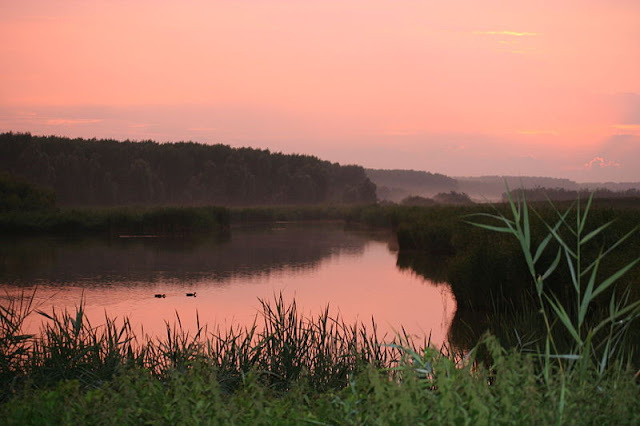 The Oostvaardersplassen has become in forty years one of the most important nature reserves in Europe. It is quite astonishing to think that these idyllic looking scenes are just a short distance from the hustle and bustle of Amsterdam. You might ask why this attempt to resurrect a long since vanished ecosystem has been made. The simple answer is that when human settlements were established throughout Europe, many keystone species such as mammoths and rhinos were wiped out. When these species disappeared (thanks to us!) so did their dynamic ecosystems which had been in place for tens of thousands of years. The Oostvaardersplassen is the first real attempt to do more than just talk about creating a place where biodiversity can flourish. 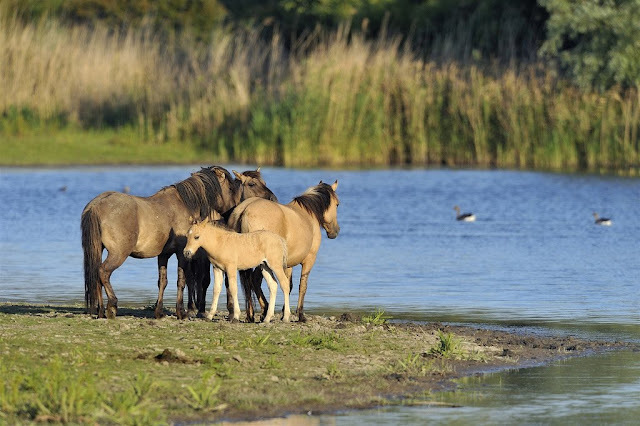 There are over 3,000 large mammals at the Oostvaardersplassen – and of course they are only approximations of the extinct species which once roamed Europe. However, the rewilding of this place has created a unique ecosystem. Their presence is dramatically reshaping the area. Plus, it is just a stone’s throw from the capital of the Netherlands, Amsterdam. The whole place challenges an assumption long held about wildness. Generally people think of dense forestation when they think of wildness. In other words when you leave a place to its own devices it will naturally turn to forest. In terms of ecology this is known as succession and the theory goes that ecosystems unfold due to succession in much the same way as natural selection rules evolution. The Oostvaardersplassen not only challenges this assumption, it proves it wrong. When our ancestors tamed and corralled mammals such as cattle and horses and killed off larger ones, such as the mammoth that meant that, sure enough, where man did not intervene then forest took over. So succession is more or less a result of human intervention. The Oostvaardersplassen proves that if left alone to roam large mammals will produce a very different ecosystem to the one we might expect. The large herbivores that used to exist in this part of Europe included the tarpan a wild horse that has been replace here by the konik horses that you see here. The European bison and elk are also extinct but are represented here by Heck cattle. It is hoped that the wisent or European bison can be reintroduced here too. The Oostvaardersplassen is an isolated area in many ways. There are, at the moment, no corridors to other nature reserves. Plans exist, however to form a corridor between it and the Horsterwold, a young forest near Zeewolde. Ultimately this should allow deer and other animals to move all the way to France and Germany. It is a bold plan but one which should, if it works, increase the biodiversity of Europe significantly. If you enjoyed this article, please consider making a gift to help Ark In Space to continue to bring you fascinating features, photographs and videos. The Schmidt Sting Pain Index: How Much Could You Take? The Earth - our beautiful blue orb circling the sun is home to so many diverse species of animals. The Ark In Space serves as a compendium of these species in all their glory, drawing on the finest Creative Commons photographs available on the internet. So, enjoy your time on this website and revel in the beauty and diversity of our animal life. The Earth truly is an Ark In Space.